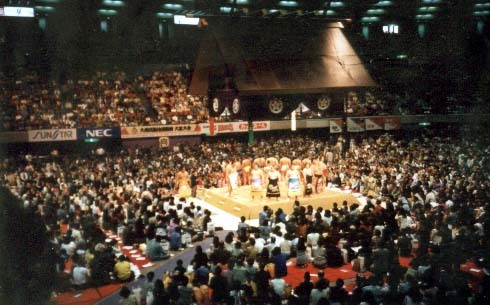 Sumo wresting, a beloved traditional sport. One sumo match lasts but a few seconds. Sumo, o-sumo-sama, circle, 4 1/2 meters, seconds, push, carry, inside, outside, huge, match, crowd, sit, zabuton, watch, salt, throw, famous, win, lose. Series of events, measurement, time.